Americans use an average of 410 billion gallons of water per day. Where does all that water come from and where does it go? 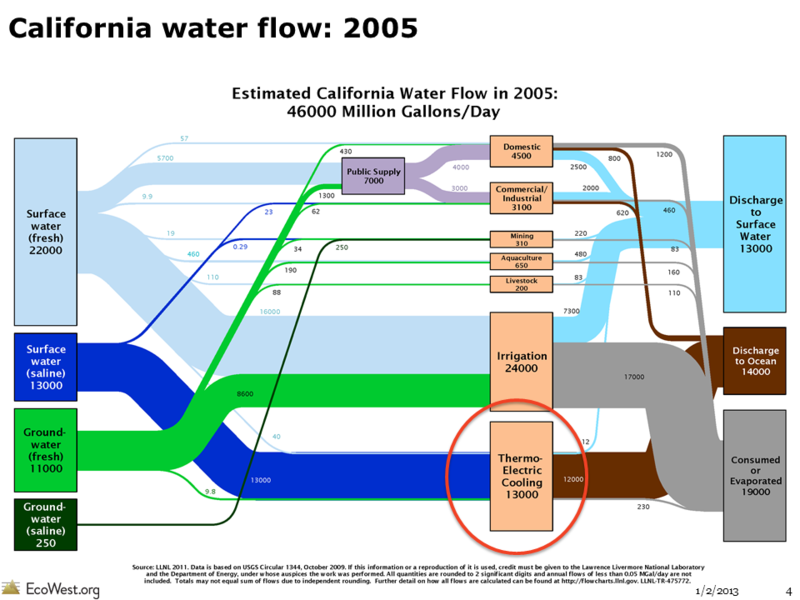 Flow diagrams from the Lawrence Livermore National Laboratory provide excellent summaries of the nation’s water use. These graphics, also known as Sankey diagrams, show how much we pump from groundwater aquifers, how many gallons of surface water we divert, and which economic sectors use the most water. In this slide deck (download links at bottom of post), I’ve pulled together the flow diagrams for the 11 Western states, which show some interesting regional patterns in water use. Flow diagrams of U.S. and Western water use from EcoWest on Vimeo. Lawrence Livermore produces similar graphics for energy and carbon dioxide. In another post, I provide a little background on Sankey diagrams, which are a great tool for visualizing how a commodity flows through a system. Data for the water diagrams come from the U.S. Geological Survey, which publishes a report every five years summarizing the nation’s water use (the latest year available is 2005). Fresh surface-water, from lakes and rivers, is used at large scale in every sector of the economy. Saline surface water, primarily ocean water, is mostly used for once-through thermoelectric cooling, although some ocean water is used for industrial cooling and a small but growing amount of ocean water is being desalinated for public consumption. Significant quantities of fresh groundwater are used in irrigation and fresh groundwater plays an important role in both public supply as well as self-supplied domestic water consumption. Brackish groundwater is the most difficult water resource to use and is therefore primarily used in the mining sector and in power production (often in geothermal power plants). The state-level slides reveal that water is managed very differently across the West, with some residents heavily dependent on surface water and others more reliant on groundwater. In Montana, Utah, and Wyoming, saline groundwater is an important source for mining and industry, while in Idaho and Oregon there’s a fair amount of fresh water devoted to aquaculture. Across the region, the water delivered to homes and businesses is just a fraction of what’s devoted to growing crops. Consider the arid state of Arizona, where discussions about water tend to focus on the state’s growing cities. 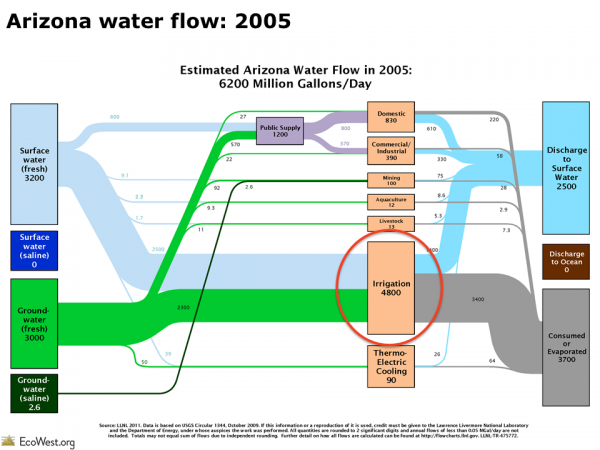 In reality, the graphic below (click to enlarge) shows that farming totally dominates water consumption in Arizona. When examining these slides, it’s important to remember that the size of the rectangles and the connecting lines are not comparable from state to state. Instead, they show the proportions of surface water and groundwater that are directed to various uses within each state. Water use data is notoriously hard to compile. Accounting policies vary between different water management districts and water use is not metered in the same way that higher-priced commodities are sold. Quantifying water use by location and sector requires substantial estimation.Water disposition is even more difficult to quantify. While the quality of wastewater discharge is measured regularly for environmental purposes, the total quantity of wastewater is not carefully monitored, especially when that wastewater already meets environmental regulations for discharge. Despite these drawbacks, I’ve found these diagrams to be super-helpful in understanding Western and national water-use patterns. Once the U.S. Geological Survey releases data from the 2010 report, which isn’t expected until 2014, it’ll be interesting to see if there have been any significant shifts in water use.